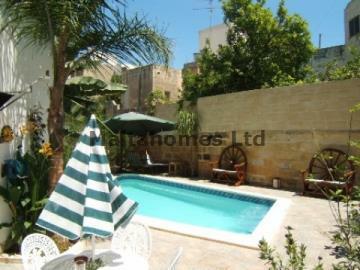 Situated village core in Luqa, this rustic Town House comes fully furnished and ready to move into. Entrance to Hall through to the living room, staircase to first floor, fully equipped kitchen/diner with access to pool/garden area, terrace with barbeque area, gym room and utility room. To the first floor there are two bedrooms with their own balconies, of which the main balcony has views over the garden/pool area. Furthermore, there is an open roof space with views of most of Luqa and parts of Mdina. Overall this is a beautifully converted Town House with all the period features one would look for. A new owner occupier could easily introduce a third bedroom.